More of our graduates go into business programs at university than any other discipline. At St. Andrew's, business courses are part of the History & Social Science Department. This is because we believe that the skills of research, writing, and critical thinking, as well as knowledge of history and world issues are all important components of preparation for a life in business management. Of course, these courses focus on marketing, case studies, accounting, entrepeneurship, public speaking, and business management. Our McEwen Leadership program gives focus and vitality to our business program. We are very proud of this unique approach to business studies in high school. Please Note: This only pertains to new students who are entering St. Andrew’s in grade 10, coming from another school, who have obtained a credit in the grade 9 Introduction to Business, course code BBI1O. They are not eligible to take BBI2O as the course content is identical, and a credit can only be issued for one of these two courses. This course will help students combine the skills required for and knowledge of different subjects and disciplines to solve problems, make decisions, create personal meaning, and present findings beyond the scope of a single subject or discipline. 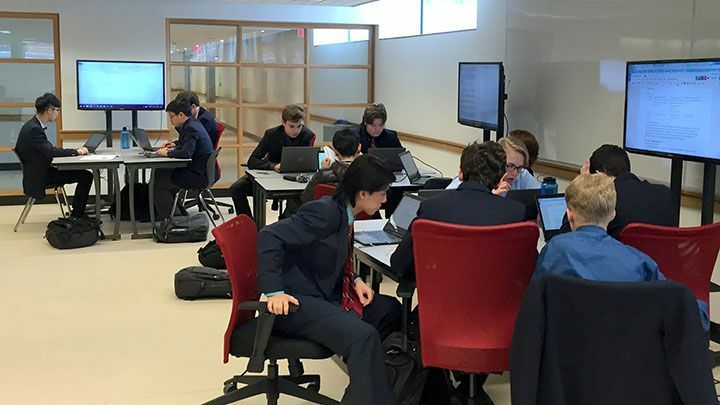 Through individual and collaborative inquiry and research, students will analyse the connections among diverse subjects and disciplines; develop information literacy skills in analyzing, selecting, evaluation, and communication information; and become aware of a variety of resources and viewpoints on contemporary issues. They will also examine their own learning styles, relate their inquiries and research to real life situations and investigate career opportunities in new disciplines. Enrolment in this course is competitive and subject to a thorough assessment of the student’s ability to demonstrate the overall and specific curricular expectations of the BBI2O – Introduction to Business course, taken at St. Andrew’s College. Most successful applicants achieve a mark of >85% in BBI2O. This online course provides an overview of the importance of international business and trade in the global economy and explores the factors that influence success in international markets. Students will learn about the techniques and strategies associated with marketing, distribution, and managing international business effectively. This course prepares students for post-secondary programs in business, including international business, marketing, and management.